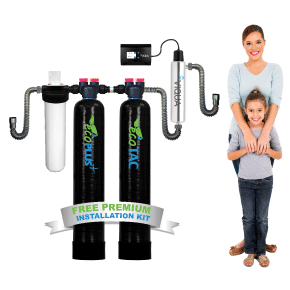 Home Water Purifiers & Filters is pleased to offer a complete selection of home water filtration and purification products, including sophisticated multi-stage point-of use reverse osmosis (RO) systems and whole house ultraviolet sterilizer systems. 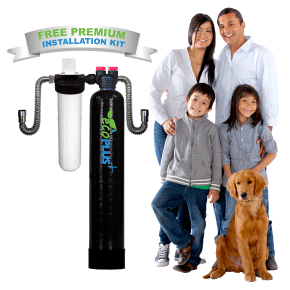 We also carry a wide variety of whole-house sediment and carbon filters to tackle any water filtration task, a Chromium-6 water filter, and an innovative low-cost iron reduction filter that removes iron, manganese, and hydrogen sulfide odor! Our site also contains a wealth of information (see our Education Center) to help you select the best water filter / purifier for your specific needs, including information on common contaminants, the purification of well water, identification and treatment of hard water, and specific information on reverse osmosis, ultraviolet treatment, granular activated carbon (GAC), carbon block, and other water treatment technologies. Have Questions? Give us a call Toll Free at 1-866-376-2690! HomePlus Water is one of the largest distributors of water treatment systems, UV sterilizers, replacement water filters, and water treatment accessories in the U.S. and Canada. Our Certified Water Technicians will help you solve even the most complicated residential and commercial water problems. Our warehouse-direct structure and shipping depots in both the U.S. and Canada enable us to provide industry-leading pricing and fast delivery. So, you can expect not only advice from some of the most knowledgeable technicians in the business, and great pricing too. Moreover, we provide free shipping on all orders over $79 and most orders arrive at your door in only a few short days. Have an urgent problem? Ask our staff about express overnight shipping options for your order.